Reclaimed wood console table with lower shelf made from authentic, hand-hewn, salvaged wood from barns and cabins in the upper Midwest. 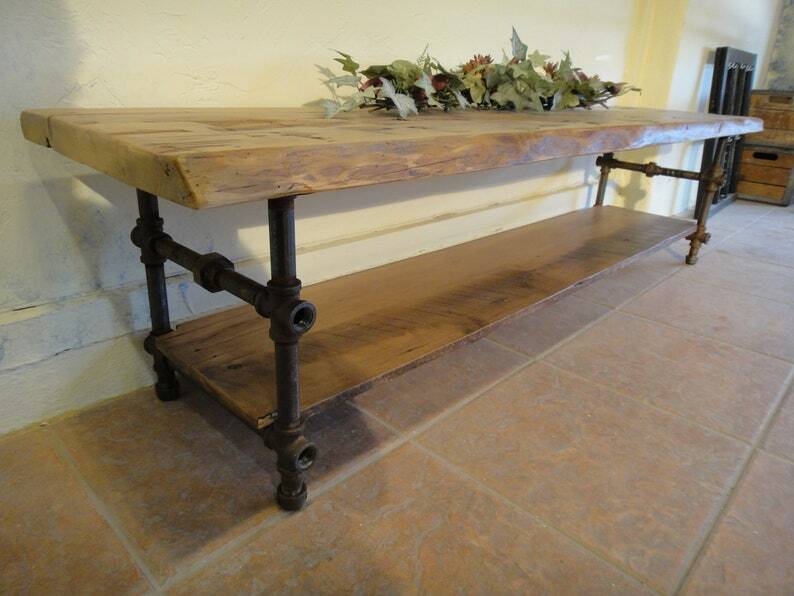 This versatile piece works as an entryway table, wine server, sofa table, sideboard or coffee table. Custom made to your specifications including length, width, height, finish and shelf placement. 2) Choose your wood finish from the drop down menu. I am happy to custom mix a shade to work with your own furnishings, floors, woodwork etc... Please inquire if interested. 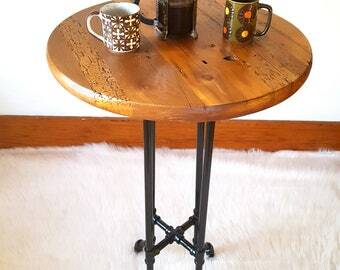 3) Our standard height is 30" tall, dining room table height. 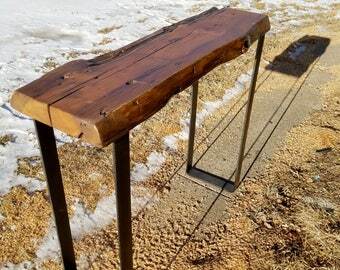 I am happy to make them any height you would like including coffee table height. Just make a note in the comment section of your order. There is an extra charge for tables taller than 36". Please inquire if interested. 4) The standard shelf height is 12" from the floor however, the shelf can be positioned at about any point. Make a note in the order section if you would like a different shelf height. We are so happy with how our hall table! It was a difficult spot, and Chris worked with me so it fits perfectly. He communicated promptly with me throughout the process and worked with me to ship so it would arrive while we were in town. It was packaged securely and everything arrived in great condition. It was quick and easy to assemble. Thanks so much Chris, we love it! Chris was amazing to work with! The table is just perfect for the use we wanted as a vanity in our bathroom. Chris listened thoughtfully to my requests and went above and beyond to make a table to my specs. The packaging was expertly done and the table arrived on the date promised. I highly recommend this seller!